Rugby is the fastest growing sport in America. In the last 5 years, the number of participants has increased by 14% to a total number of 1.2 million athletes and the efforts to grow the sports continue.This week USA Rugby announced that North America's first ever professional rugby union league will be launched next year in April 2016. The league will be governed by the USA Rugby and World Rugby organizations, and the competition will be organized by Professional Rugby Organization (Pro Rugby). "We are very happy to partner with the PRO Rugby in taking this step to popularize the game, to inspire Americans to fall in love with rugby, and to show the rugby world what American players can do," said USA Rugby chairman, Bob Latham. The league will allow no more than 5 non-North American players per team and will feature 6 city based teams in the northeast, Rocky Mountains and California, according to PRO Rugby. Philadelphia, Denver, Sacramento and San Francisco are confirmed cities, while New York City is still under negotiation. After the announcement of Rugby Sevens returning to the Olympics next summer and the Rugby World Cup this fall, there's a lot of international excitement that surrounds rugby. 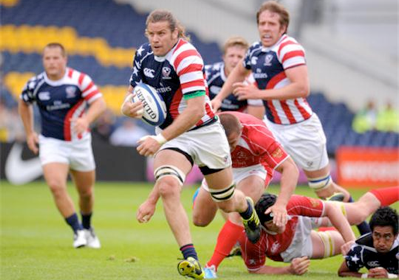 And, despite losing every game in the World Cup, USA is on board with building momentum for Rugby in North America. "Rugby is a natural fit for our country," Doug Schoninger, PRO Rugby CEO said in a press release announcement. "Participation and interest in the sport is at an all-time high and the demand for a professional competition is clear." Rugby is still a young sport compared to others in the US, but it's building up to taking its rightful place among the All-American favorites. Considering the controversy surrounding football head injuries, Rugby, with its better safety practices and tackling methods, can become a strong contender as an American sport. With school closing down football programs due to injuries, Rugby could be a healthier alternative to keep children engaged in sports while adding the much needed element of better safety. The rugby league is the first building block in securing the sport's stronghold on "this side of the pond" and in insuring continued growth of rugby in North America.